Mark Saffman is in the Department of Physics, University of Wisconsin–Madison, Madison, Wisconsin 53706, USA, and at ColdQuanta, Inc., Madison, Wisconsin. The world around us is made of atoms. There are enormous numbers of them, even in small objects such as the computer chips and solid-state lasers that are the building blocks of the information age. Erwin Schrödinger, one of the inventors of quantum mechanics, wrote1 in the 1950s that “we never experiment with just one electron or atom”. However, laser-based techniques developed over the past 40 years are now routinely used to slow atomic motion and to isolate, trap and control certain individual atoms in focused laser beams. Two papers in Physical Review X, by Cooper et al.2 and Norcia et al.3, and a third published on the arXiv preprint server by Saskin et al.4, report that these techniques can be extended to atoms that have two outer (valence) electrons, which opens up applications. Research groups around the world use patterns of light to trap arrays of individual atoms in one, two and three dimensions for experiments in quantum simulation and computing5,6. These optical traps for atoms are analogues of the optical-tweezer technique used to confine large or electrically neutral particles, which has transformed the biological sciences7 and was recognized with one-half of the 2018 Nobel Prize in Physics. The ability to trap individual particles is also having a substantial impact on the fields of atomic and quantum physics. The methods of laser-based cooling and trapping as applied to electrically neutral atoms were first developed using alkali elements — those that occupy the first column of the periodic table. Alkali atoms have a single valence electron that interacts strongly with laser light at visible or near-infrared wavelengths. This strong interaction allows the atoms to be cooled and trapped relatively easily. Although remarkable advances have been achieved using alkali atoms, researchers have not shied away from exploring other columns of the periodic table in search of atoms with more-advantageous properties. The three current papers demonstrate the ability to cool and trap single strontium2,3 and ytterbium4 atoms in 2D arrays of up to roughly 100 optical traps. Strontium is an alkaline-earth element — an element from the second column of the periodic table. Strontium atoms have two valence electrons and a more complex structure of electronic energy levels than alkali atoms. Although ytterbium is not an alkaline-earth element, ytterbium atoms also have two valence electrons and have properties and an energy-level structure that are similar to those of strontium atoms. These two-valence-electron atoms have transitions of electrons between energy levels that, as in alkali atoms, can be used for rapid cooling. But they also have transitions that can be used to reach even lower temperatures. Such transitions are not present in alkali atoms (Fig. 1). Figure 1 | Atomic energy-level structures. a, Atoms that contain one outer (valence) electron have a rather simple structure of electronic energy levels. 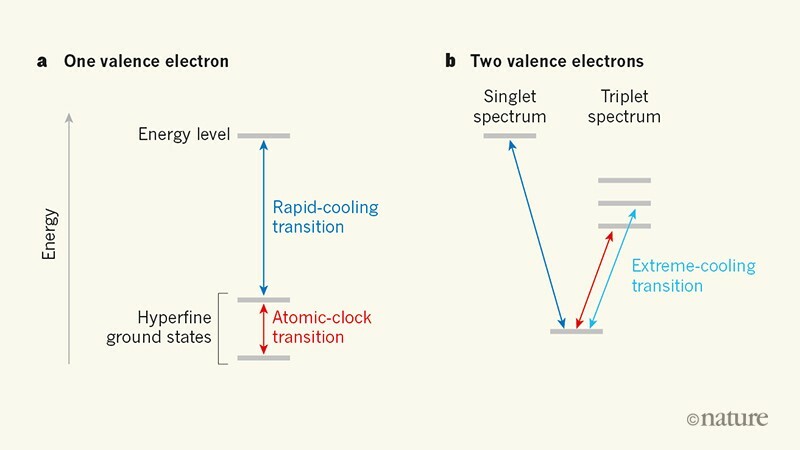 Transitions of electrons between certain levels can be used to rapidly cool the atoms, whereas transitions between two levels, called hyperfine ground states, can be used to build a microwave-frequency atomic clock. b, Atoms that contain two valence electrons, such as strontium and ytterbium, have two separate energy-level spectra: a singlet spectrum and a triplet spectrum. These atoms have transitions that can be used for rapid cooling, as in one-valence-electron atoms. But they also have transitions that can be used in optical atomic clocks and to reach extremely low temperatures. Three papers2–4 now report the cooling and confinement of individual strontium and ytterbium atoms. The demonstration of arrays of two-valence-electron atoms is an exciting development for other reasons. In the International System of Units (SI), the second is currently defined using the transition between two energy levels called hyperfine ground states in an atom of the alkali element caesium. This transition is associated with the emission or absorption of microwave-frequency light. However, advances in the past decade have shown that higher-accuracy atomic clocks can be built using transitions in atoms or ions at optical frequencies. The atoms that currently provide the most precise optical atomic clocks in the world8 are the same as those that have now been individually trapped: strontium and ytterbium. The new results have two implications for the development of future atomic clocks. In current practice, such clocks are based on lattices that have ensembles of up to a thousand atoms at each lattice site. Within each site, the atoms are randomly distributed, and the weak, but non-negligible, interactions between atoms contribute to uncertainty in time readings obtained from the clock. The ability to build arrays of strontium and ytterbium atoms one atom at a time will enable the spatial distribution of the atoms, and therefore their interactions, to be engineered in ways that could reduce sources of uncertainty. The second implication for clock development is intimately connected to the potential use of strontium and ytterbium atoms as quantum bits (qubits) in quantum-information processing. There are several options for qubit encoding, because these atoms have both fermionic and bosonic isotopes — isotopes whose total numbers of protons and neutrons are odd and even, respectively. For the fermionic isotopes, qubits can be encoded in energy levels known as Zeeman substates. This encoding could involve a single qubit as in ytterbium-171, which has two substates, or many qubits as in strontium-87, which has ten substates9. For the bosonic isotopes, qubits can instead be encoded in the energy levels that form the basis of the optical atomic clock. Once qubits have been encoded in suitable energy levels, interactions between qubits can be engineered to carry out operations called quantum logic gates and to produce quantum states that are entangled (correlated in a non-classical way). This engineering could be achieved using collisional interactions, as has been demonstrated for alkali atoms10, or by using long-range interactions between atoms that are in excited ‘Rydberg’ states6. The latter interactions are the leading contender for quantum logic gates based on neutral-atom qubits. Alternatively, many-atom entangled quantum states could be produced directly, without resorting to a laborious sequence of pairwise interactions, using methods known as Rydberg dressing techniques11. Irrespective of the approach chosen, the availability of entangled atoms would have the potential for achieving clock precision in which the uncertainty is inversely proportional to the number of atoms — a substantial improvement over the usual case of uncorrelated atoms, in which the uncertainty is inversely proportional to the square root of the number of atoms. There is good reason to think that, with further development, arrays of single two-valence-electron atoms will lead to advances in optical atomic clocks. Although the focus has been on neutral-atom clocks, those based on ions have comparable accuracy, but their stability is limited because they use only a single ion. Arrays of single neutral atoms could provide the best of both worlds: the accuracy of ion clocks and the stability that comes from using many atoms, without the uncertainty that stems from multi-atom interactions in present-day neutral-atom clocks. Whether or not two-valence-electron atoms will prove to be superior to alkali atoms for quantum simulation and computing remains to be seen. Experiments have already demonstrated high-quality measurements of the quantum state of single strontium atoms12. The outlook for corresponding advances in Rydberg gates for computation is less certain, because the properties of Rydberg states in two-valence-electron atoms are more complex, and less-well studied, than those in alkali atoms. More work is required to accurately characterize these properties before a definite conclusion can be drawn. Nevertheless, the availability of arrays of single strontium and ytterbium atoms will provide a crucial experimental tool for such studies. Schrödinger, E. Br. J. Phil. Sci. 3, 233–242 (1952). Cooper, A. et al. Phys. Rev. X 8, 041055 (2018). Norcia, M. A., Young, A. W. & Kaufman, A. M. Phys. Rev. X 8, 041054 (2018). Saskin, S., Wilson, J. T., Grinkemeyer, B. & Thompson, J. D. Preprint at https://arxiv.org/abs/1810.10517 (2018). Gross, C. & Bloch, I. Science 357, 995–1001 (2017). Saffman, M. J. Phys. B 49, 202001 (2016). Ashkin, A., Dziedzic, J. M., Bjorkholm, J. E. & Chu, S. Opt. Lett. 11, 288–290 (1986). Ludlow, A. D., Boyd, M. M., Ye, J., Peik, E. & Schmidt, P. O. Rev. Mod. Phys. 87, 637–701 (2015). Gorshkov, A. V. et al. Phys. Rev. Lett. 102, 110503 (2009). Kaufman, A. M. et al. Nature 527, 208–211 (2015). Khazali, M., Lau, H. W., Humeniuk, A. & Simon, C. Phys. Rev. A 94, 023408 (2016). Covey, J. P., Madjarov, I. S., Cooper, A. & Endres, M. Preprint at https://arxiv.org/abs/1811.06014 (2018).